You want to sail Europe in winter, but still feel like you’ve come to an exotic place? If so, the Canary Islands, known as the “Fortunate Isles”, are the perfect sailing destination for you. By cruising between the seven main islands, you will see a rich natural diversity. Visit the spectacular Teide National Park located on the biggest Tenerife island, or take a swim on Playa de las Americas. See the desert-like Maspalomas Dunes or catch a fish for your romantic dinner on Gran Canaria. 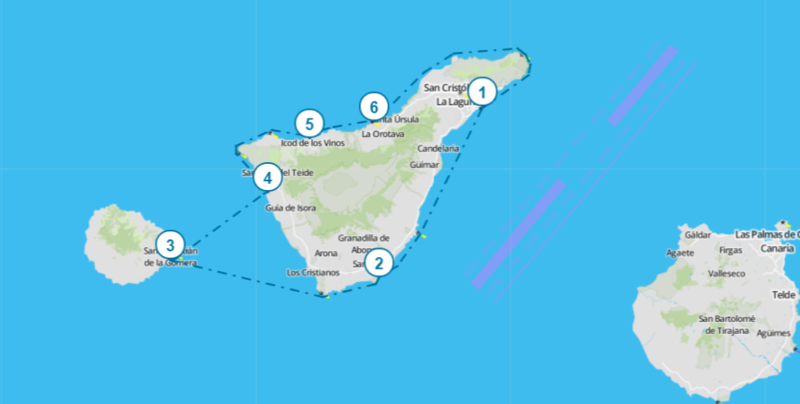 For more attractions in this region, read our Canary Islands Sailing Guide. Thanks to its biodiversity, the Canary Islands are like a miniature continent. Yacht charter in the Canary Islands offers you more than 150 km of pristine sand beaches and emerald green waters in a windsurfers’ mecca – Fuerteventura. On Lanzarote Island, you will feel like you are on the Moon thanks to the lunar landscape and lava tubes. On La Palma Island, you can look at the stars in one of the several observatories. Pay a visit to an ancient laurel forest in Garajonay National Park on La Gomera Island and explore 46 dive sites full of volcanic features and spectacular marine life on El Hierro Island. 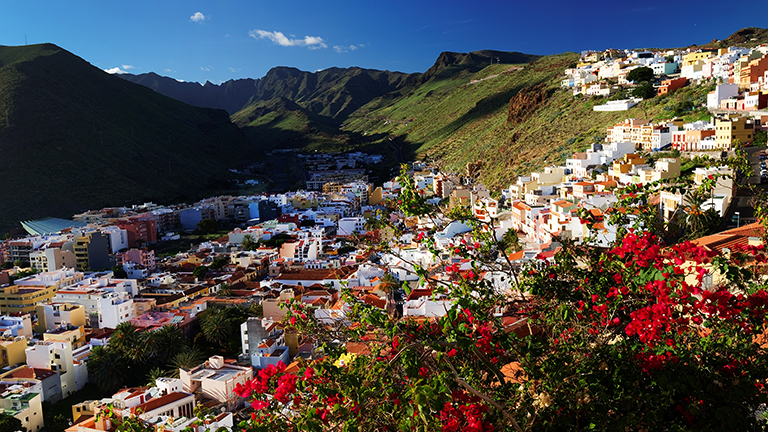 In a nutshell, the Canary Islands region is a place you will never get tired of discovering! The Canaries are a perfect choice for sailing throughout the whole year due to their north-east trade winds. However, the strongest winds blow in July and August, and the lightest winds in October and November. Keep in mind that high mountain areas can create different wind conditions. Arrive to Tenerife North Airport and make your way towards Santa Cruz de Tenerife Port where you will check-in and board your yacht. 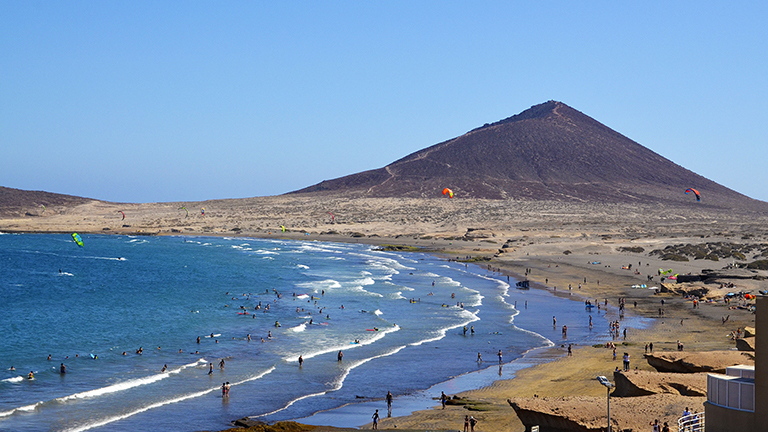 Then sail to your first destination El Medano, a small laidback resort with a few kilometers long golden-gray sand. Constant winds are ideal for surfing, which is why El Médano is a surfing paradise. Its family-friendly beaches with sunbeds and parasols, shallow waters and clean sea will offers you a nice relaxing holiday. It is especially quiet here because there is no typical nightlife. Walk the promenade that is filled with shops, cafés and restaurants where you can try Spanish tapas, fish and seafood with a glass of fine wine. 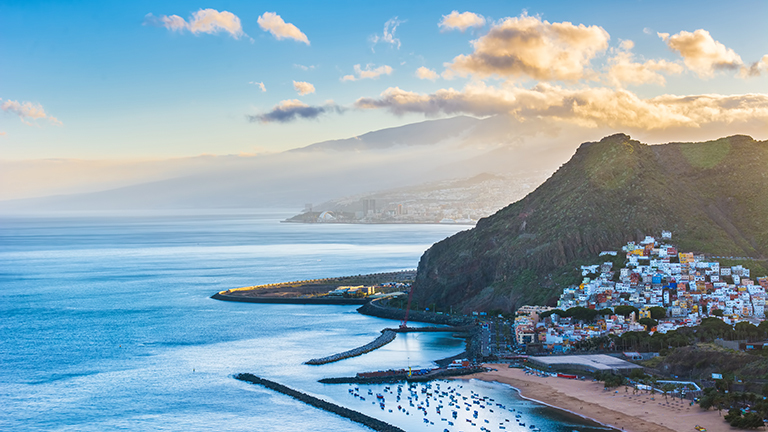 Sail towards La Gomera Island and moor in island’s capital San Sebastián de La Gomera. Spend the day lounging on two beautiful city beaches – Playa de San Sebastián and Playa de la Cueva – or on a secluded Playa de la Guancha. The city is an ideal place for shopping, drinking coffee in open-air cafés, and strolling around lively streets and squares. Make sure to try local food: palm honey, almogrote (cheese spread), mojo (sauce with different spices) and Canarian wrinkly potatoes. Do not miss an opportunity to visit Casa del Colón, a museum dedicated to Christopher Columbus that stopped here while on his voyage to discover America. Go back to Tenerife island and moor in Los Gigantes, a tranquil resort town that is famous for its giant rock formations that offer spectacular sunset views. 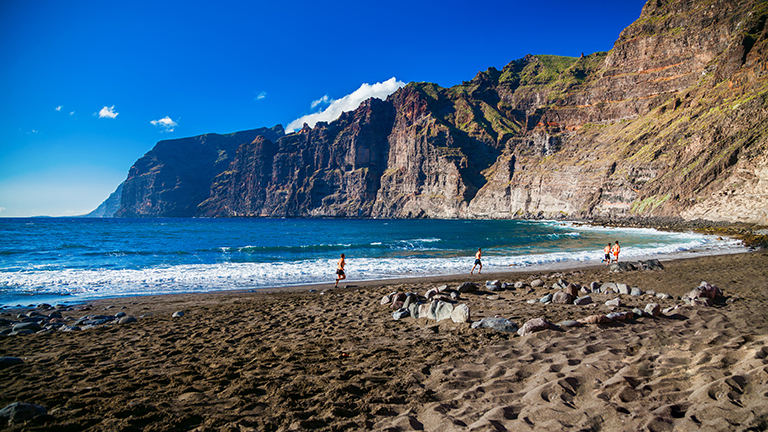 Volcanic black sand beach is a perfect place to change the usual setting of golden beaches. There are plenty of natural seawater pools where you can enjoy calm waters. You will be able to see playful dolphins and whales while sailing around the area. The seabed is as dramatic as the scenery above the sea, so think about diving. Relax in bars and eat fish in restaurants on the boulevard. 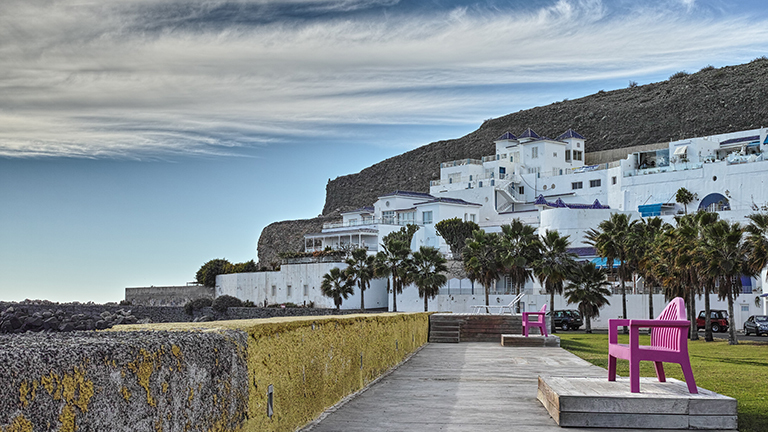 Puerto de Santiago and La Arena are nearby resorts that you can also visit either by boat or by foot. 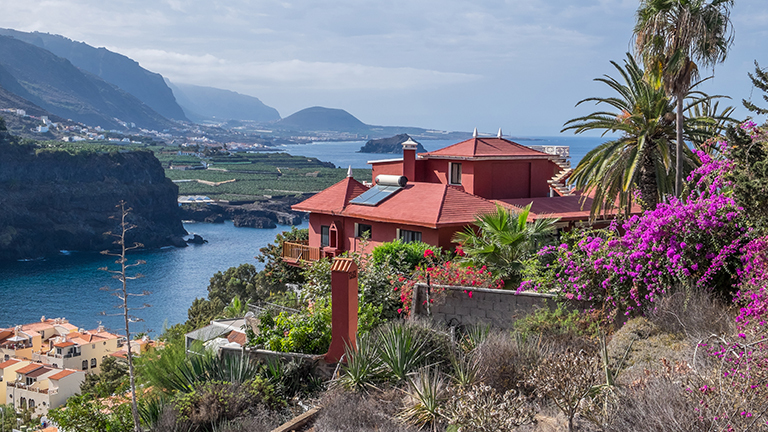 Sail along the coast of Tenerife to reach its northern part where you can anchor in a small rocky bay of San Marcos. Protected by high cliffs from strong waves and winds, the beach is perfect for spending your day on black volcanic sand and in warm sea. Peaceful and unspoiled beach offers sunbeds, umbrellas, showers, as well as other amenities. Take a walk on the promenade and have a meal in a restaurant, or have a drink in a bar or a café. Enjoy in a friendly atmosphere of a small village that enjoy mass tourism-free way of life. Just 10 NM east lies Puerto de la Cruz, an attractive and popular resort with green landscape and tropical fruit plantations. You will enjoy walking in narrow cobbled streets, gardens and parks. Eat delicious Spanish/Canarian food and drinking fine wines, shop in high-end boutiques and attend live music venues. Lounge on any of the several sheltered beaches and watch the clear skies during both day and night. If you want to escape the hot temperatures, visit Loro Parque, an animal adventure waterpark with one of the largest penguinariums in the world with tons of artificial snow. 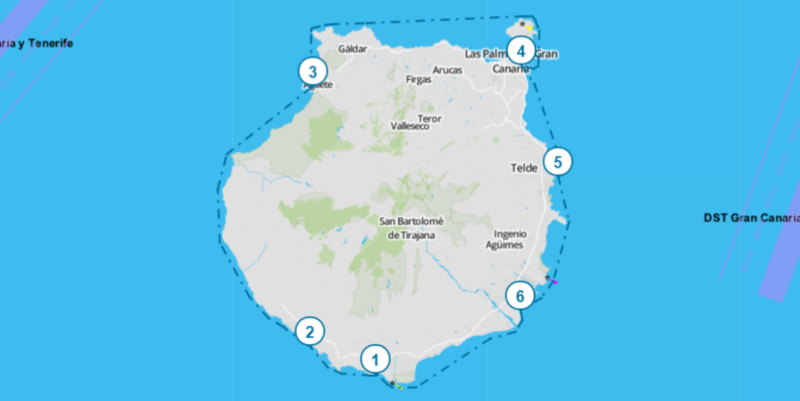 Circle the island on its northeastern side and reach your starting destination Santa Cruz de Tenerife. 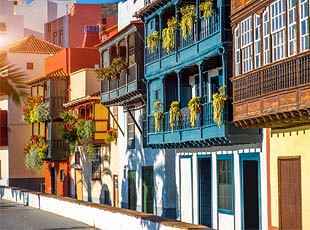 This beautiful and bustling port city will amaze you with its colorful buildings and amazing architecture, such as the Auditorio that is shaped like a wave. Soak up some sun on the large sandy beach Las Teresitas or go to a quieter Las Gaviotas Beach that attracts a number of nudists. There are plenty of museums to visit, plenty or restaurants and bars to relax in, and plenty of public sites to see. Spend your last night having fun outdoors. Since Santa Cruz offers a lot to see and taste, you should spend more time in the city. Have breakfast on your yacht or check-out and enjoy a meal on one of sunny terraces. Visit souvenir shops and take a bit of this holiday home with you. 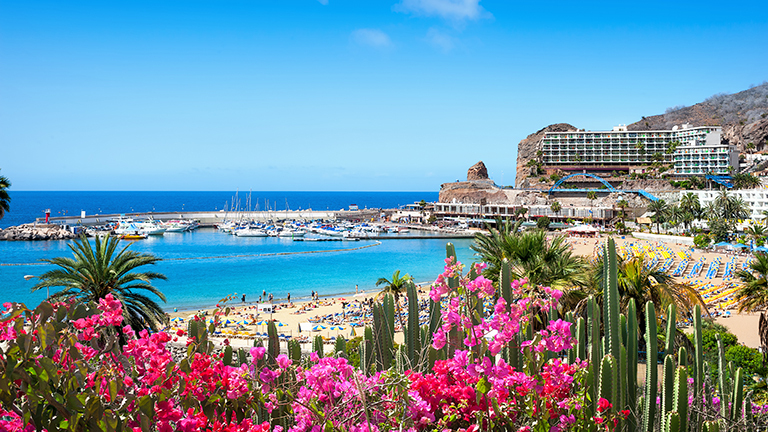 Arrive to Gran Canaria Airport and head to Pasito Blanco, your starting destination of your sailing holiday. 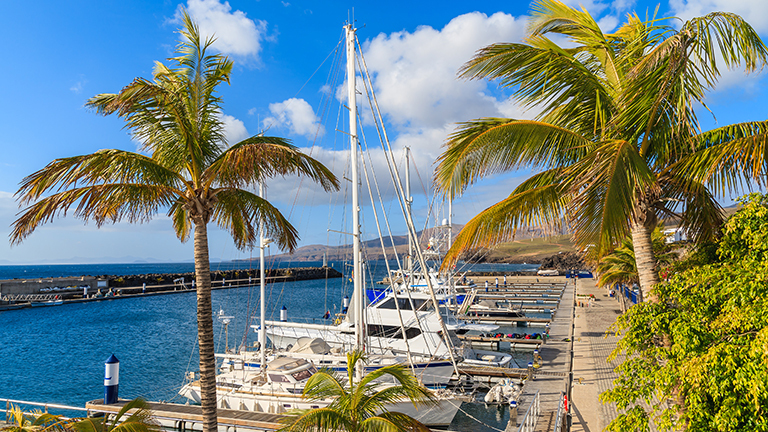 Board your yacht sail for an hour to Puerto Rico de Gran Canaria, a bustling holiday resort situated on steep slopes of a volcanic valley from which you can get stunning views of the coastline. Relax while sunbathing on beautiful, organized, family-friendly, sandy beaches, one of which is certified Blue Flag. 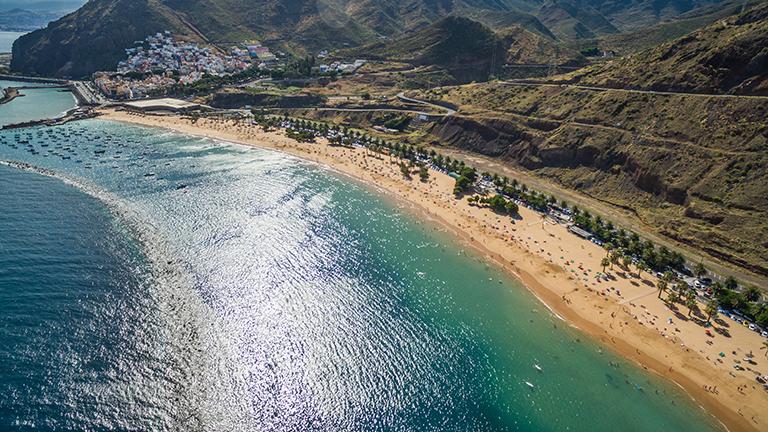 Puerto Rico has more sunny hours than any location on Gran Canaria! Swim in calm warm sea and enjoy pleasant temperatures during whole year. There is a public swimming pool surrounded with lush exotic greenery, but also a waterpark near the town with fun waterslides. In the evening, take a walk on the promenade and engage in the lively nightlife. 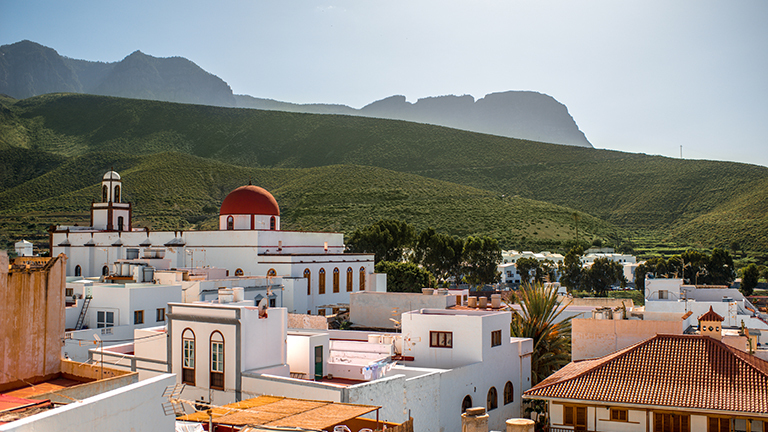 Sail north along the coast and you will pass the Tamadaba Natural Park and get to Agaete, a traditional town of whitewashed houses with green-brown or blue doors located in a green valley between spectacular cliffs. Swim in crystal-clear sea or in a set of natural swimming pools sheltered from the open ocean. For those looking for more privacy, Guayedra Beach is more secluded than the rest. 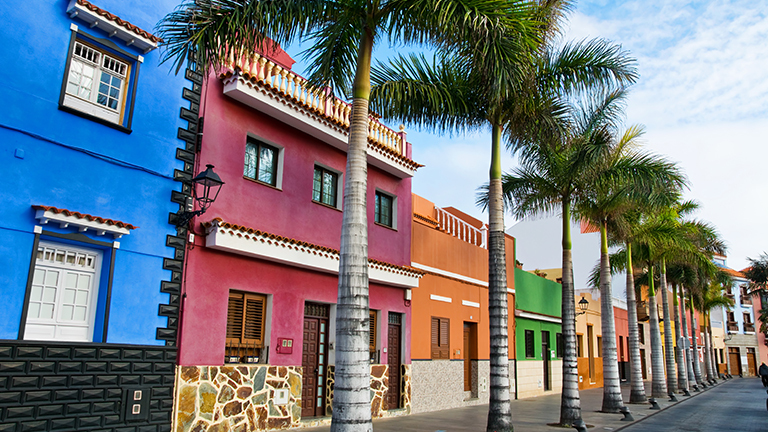 Visit Museo de la Rama and learn about the native Canary Islanders. There is also a botanic garden with rare plants from all around the world. Try local coffee, cheese, wine and tropical fruit (avocado, mango, papaya). Continue along the north coast around 20 NM to the east and you will reach Las Palmas, the capital of Gran Canaria Island, a large, architecturally rich city and an important port. The city offers a lot, from shopping in Calle Mayor de Triana, a traditional shoppers’ street, and in various markets, over tapas bars and restaurants, to beautiful beaches. 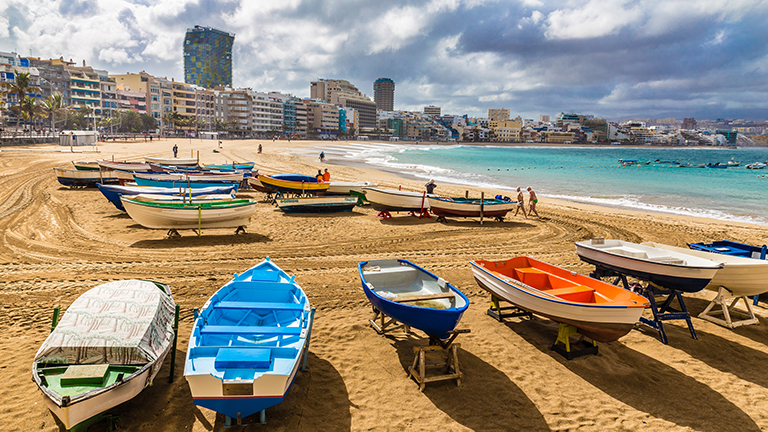 Playa de Las Canteras, the symbol of the city, is considered one of the best beaches in the world. Enjoy fresh air in Santa Catalina Park or many others. Casa de Colón Museum will give you information about Christopher Columbus who, allegedly, stayed here before discovering the Americas. 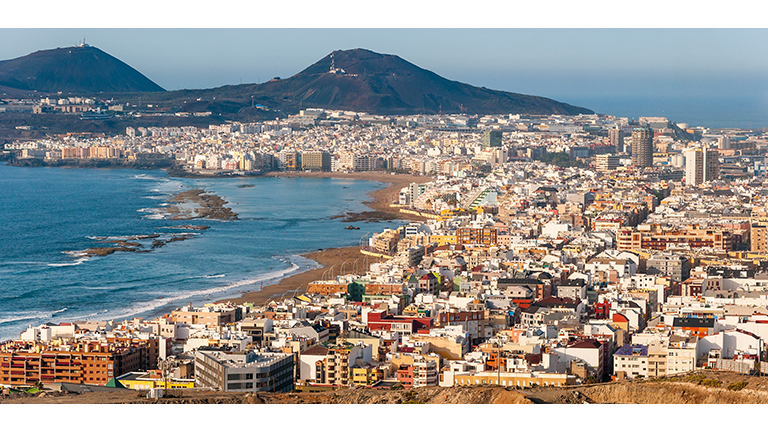 Las Palmas is a melting pot of different cultures where you will have the opportunity to relax on the beach and use the saved energy in the evening when the lively nightlife starts. Spend the day lounging on the beach, or rather three beaches. The first one is Playa del Hombre, a sandy and sunny beach that is splashed with strong waves, thus being called a surfers’ beach. It is surrounded by homes, so you will see a lot of locals. Take a walk on the promenade that is decorated with big palm trees. The second one is Playa de Melenara, a non-touristy Blue Flag beach with plenty of bars and restaurants that serve fish and seafood. Just next to it is the third one, Playa de Salinetas, a bit quieter Blue Flag beach for those looking for more seclusion. Sail south along the coast to Pozo Izquierdo, a small fishing village that helds World Windsurfing Championship due to reliable winds and waves throughout the year. This is why you should pay more attention to sailing in this area. Enjoy the beach that is divided into a windsurfing area and a swimming area. It is both rocky and sandy, and the sea is clean and blue. Engage in a conversation with friendly locals and learn more about history and culture of Gran Canaria. Finish the circle around Gran Canaria and come back to your starting destination Pasito Blanco. Moor in its modern and rather big marina and greet fellow sailors. The village will amaze you with its public, but secluded golden sand beach, impressive five-star hotels, green golf courses, great nightlife and a variety of restaurant where you can indulge in Canarian and Spanish cuisine. Have breakfast on your yacht and enjoy gentle breeze and warm morning temperatures. After check-out, make your way to the village and do some sightseeing and shopping. You can visit nearby ports and soak up the sun on one of the beaches. When you are ready, make you way to the airport and travel safe home. 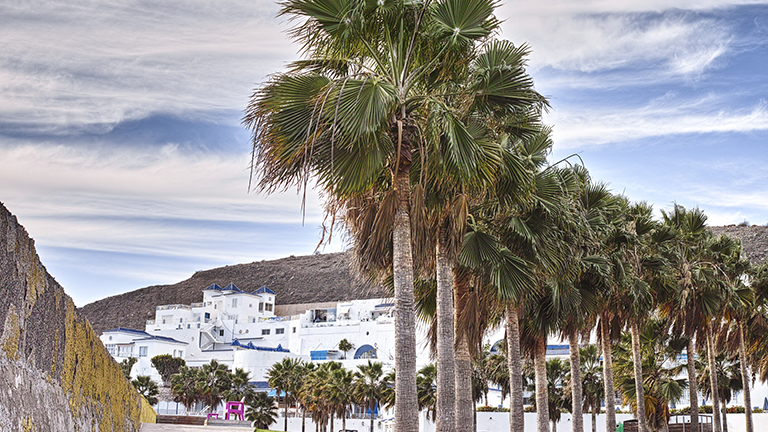 Arrive to Lanzarote Airport and take a ten minute bus or taxi ride to Lanzarote. 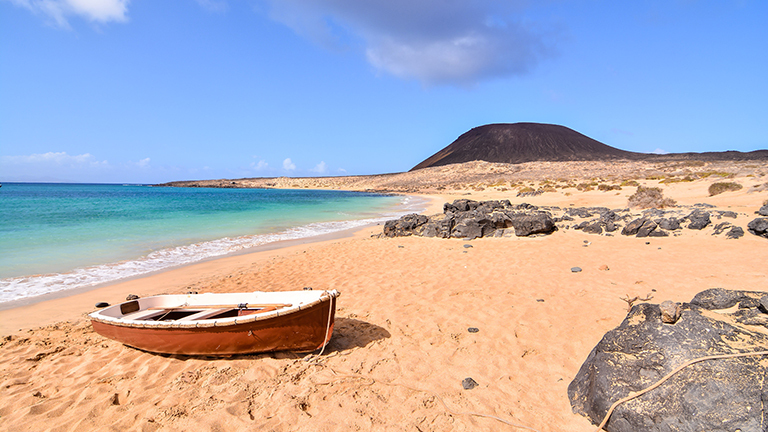 After you go through the check-in procedure, board your yacht and sail around the island of Lanzarote to the north and towards the small volcanic island La Graciosa, considered to be the eight Canary island. It is a popular tourist spot with no paved roads, so you can enjoy lively, but peaceful atmosphere. Have an active day and go trekking and biking on the mountains, or go diving, kite surfing and camping. Visit the Chinijo Archipelago Natural Park. Enjoy the lovely weather on La Laja Beach, El Salado Beach (more secluded), Playa de la Conchas or Playa Francesa. Try parrotfish, a local specialty. 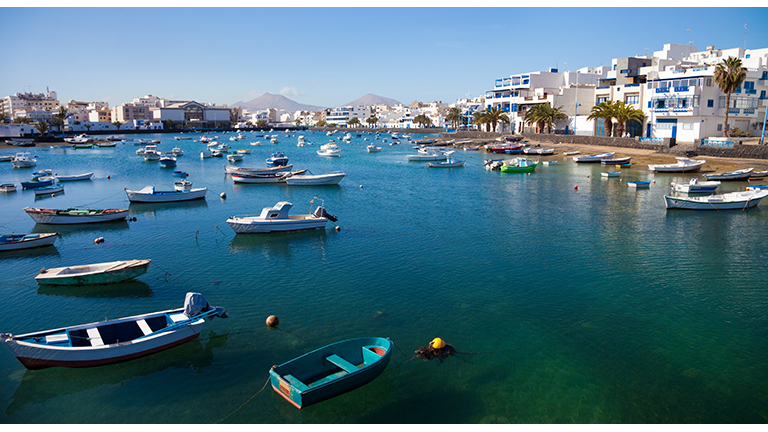 Sail along the north coast of Lanzarote and you will reach a nautical upmarket hub – Marina Rubicon. With plenty of sailing yachts and catamarans, you will have an opportunity to meet fellow sailors, exchange experiences and get tips on sailing the Canaries. The marina is protected from trade winds, so you can relax on Playa Dorada and swim in peaceful crystal-clear sea. Here you can find the first underwater museum of the Atlantic Ocean and Europe – the Atlantic Museum. Visit Castillo de las Coloradas, a watchtower from 18th century. Buy local handcrafted traditional goods, sip fine wines in trendy lounge bars and eat in gourmet restaurants. Opt for a visit to nearby towns Playa Blanca and Papagayo. 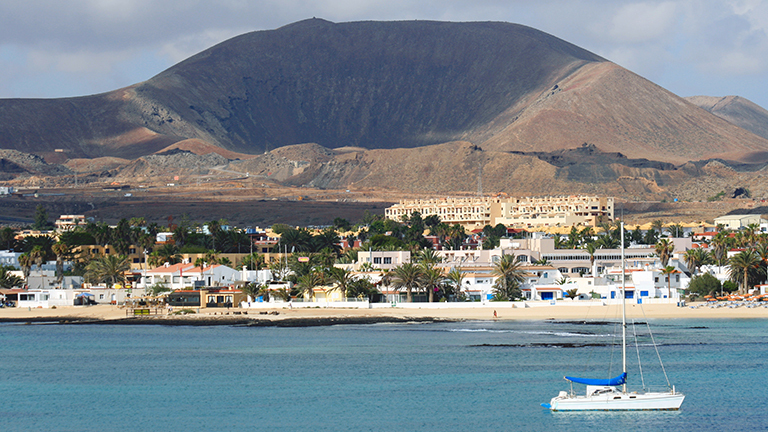 South of Lanzarote is the island of Fuerteventura and a popular tourist spot, Corralejo. Once a traditional village, it is now a perfect place for families, friends and couples to relax on town’s beaches that are sheltered from strong currents and winds. Enjoy kilometers of fine sand and clear and clean waters. 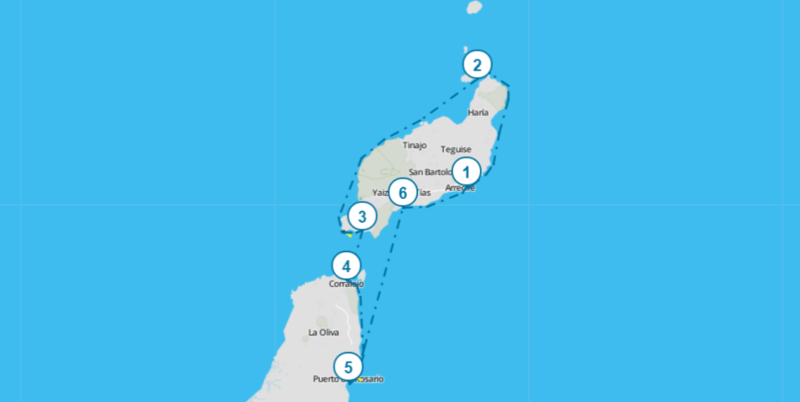 In case you want more privacy, sail to the island of Los Lobos right off the coast. There is plenty of activities to do: mountain and motor biking, safari jeep tours, watersports, wind and kite surfing, tennis… Make sure to try both Canarian and international cuisine in seafood restaurants. 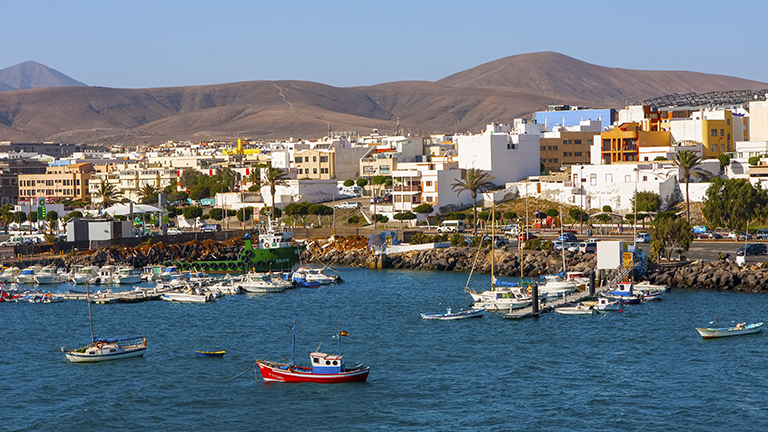 Sail south along the coast of Fuerteventura and you will be able to enjoy a cultural and economic center of the island, Puerto del Rosario. There is a small church in the city after which the city got its name. You can stroll between whitewashed buildings and on the picturesque promenade. There are five beaches in the vicinity of the city (Playa Blanca has a modern infrastructure) where you can relax and soak up the sun. Try delicious vieja (local fish), horse mackerel, papas arrugadas (boiled potatoes) and local cheese. 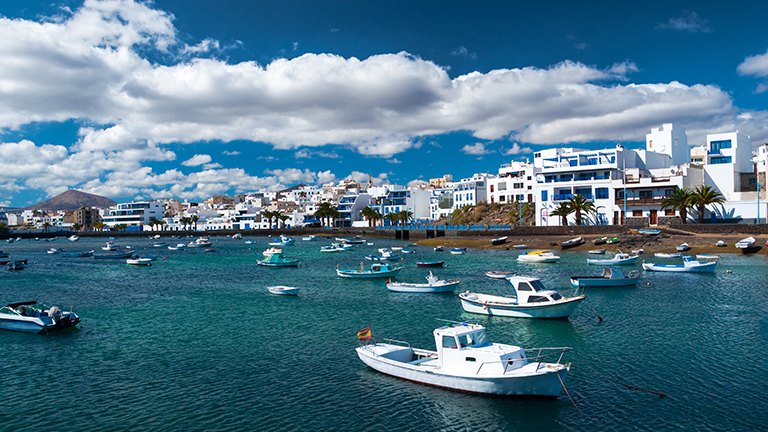 Head back to Lanzarote and enjoy the view of the naturally beautiful rocky coastline of volcanic origins. Moor in Puerto Calero; its modern marina with all services and amenities is sheltered from north-easterly winds, so you can make sure your yacht is safe. Visit the island’s top attraction, the Timanfaya National Park. Have a submarine exploration of the island’s seabed. Stay in finest villas and hotels. Visit any of the three beaches in Puerto del Carmen nearby (Playa Grande, Playa Pocillos and Playa Chica). 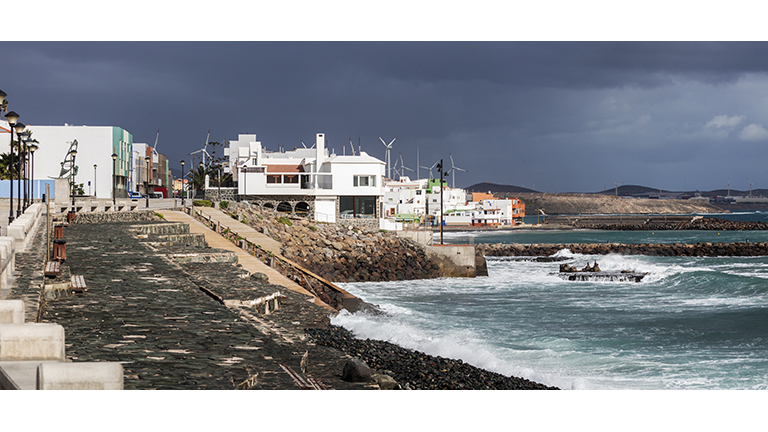 Continue sailing along the coast a few miles to the north and you will reach your starting destination Arrecife, Lanzarote’s vibrant capital and an administrative and commercial center. Do some landmark sightseeing: Castillo San Gabriel is a castle-museum from 15th century and Castillo San José is a fortress that served to back away pirates, while nowadays houses the Museum of International Contemporary Art. Chaco de San Ginés is a beautiful lagoon in the city center around which you can take a walk. Go shopping in high-end boutiques at Calle Léon y Castillo. Arrecife’s unspoilt sandy beaches Playa del Reducto and Playa del Cable offer golden sand and calm water, so you can spend your day under the sun and in the sea. Dine in seafront restaurants and choose either Canarian or international cuisine. Nightlife offers anything from lounging in a bar to drinking and dancing in clubs. In case you did not have enough time to explore the city, continue your quest today after breakfast on your yacht or in a café or a restaurant in the city. You can still take a dip in the warm sea and soak up some more sun before you leave for the airport. Interested in Sailing Holiday in Canary Islands?